From clubs offering safe spaces for members of the LGBTQ+ community to women empowerment groups, Liberty North High School has always been a school geared towards equal opportunity. Women are encouraged to take engineering and men are encouraged to take classes such as child development and culinary that were once geared towards women. This year has been no different, with the addition of a women’s wrestling team. The addition of a girls wrestling team has been a big addition for Liberty North, and over twenty girls participated in the first season. They improved vastly as the season progressed. “The women’s team have improved with their technique all season. They better understand how difficult the sport is and the toughness needed to wrestle.” head wrestling coach Thomas Goegline said. Not only was the addition a big step for the school it was also a big step for the men’s team. A sport that had been once predominately men were now open to women. “Just about everyone on the team was fine adapting to sharing the mat with women. They’ve been really supportive” Stenner said. While the women’s team learns how to move their bodies and attack opponents in different ways, they’re learning to adapt to new mental challenges as well. “Adding a women’s division to wrestling is definitely a step in the right direction. It pushes the boundaries just a little farther and continues the idea that women can dominate even in a predominantly male sport. Wrestling is such a tough sport mentally and physically, truly it builds confidence and character. So now that there’s a separate division more and more women want to join and make history for the women [that come] after them.” Stenner said. 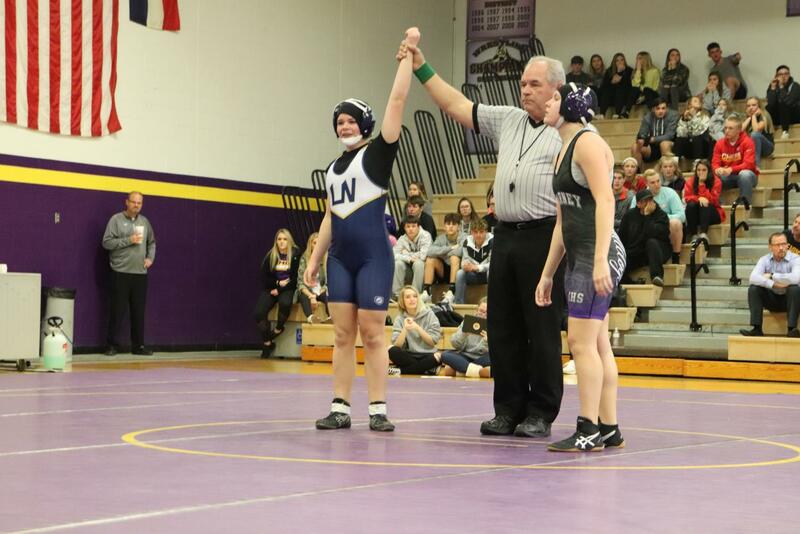 All in all, the women of Liberty North’s first wrestling team have become stronger as the season progressed, become more confident, and have found a new type of community among one of the toughest sports North has to offer. “Win or lose almost, every girl you watch will walk off the mat with great sportsmanship. I’ve grown up watching wrestling through my family and I’ve seen head gear thrown, punching mats, crying, or storming off the mat. But you just don’t see that on the women’s side. Almost every girl I wrestled told me good job after we wrestled and a lot of the time you will see girls try to help each other stand up after one girl just pinned the other. I find that super cool and eye-opening.” Stenner said.